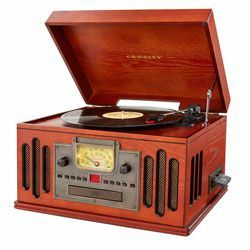 Today, vinyl players are strongly associated with a pure sound and costly collection. 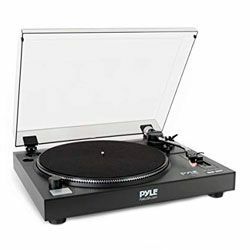 However, in the modern world, this is nothing more than just a myth, as the most famous companies now offer a large selection of turntables in such low price ranges as you can imagine. Pioneer, Music Hall, Denon, and many other famous companies are now able to offer you to choose the best turntable under 200 dollars. budget turntables usually come with fixed needle and tonearm, as they are not designed for the upgrade. 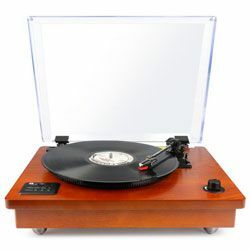 Our article is aimed to supply you with all the necessary information to choose your best turntable under 200 dollars! The 471NA-0002 is made in a classic vintage style from solid wood and has a dust cap, made from acrylic. On the front side of the turntable, you can find a volume knob. The side panel includes a stereo line in socket and two RCA out sockets. The 1byone 471NA-0002 is designed to be used as a multimedia player. It offers a playback via USB or Bluetooth. Furthermore, this device requires uninterrupted power and doesn’t use a battery, so there will be no problems with a permanent Bluetooth connection. Besides, it is equipped with an active two-way crossover, which additionally helps isolate the output. The device has a conventional cartridge and stylus, they both are supplied with a possibility to be removed if necessary, which is quite a rare possibility for a super budget turntable. 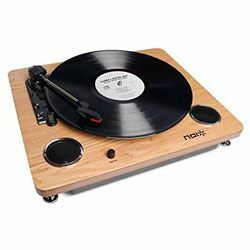 On the whole, the 471NA-0002 was made to look like a classic retro turntable but with functions of a modern device, which will certainly suit a wide range of users. It can offer you a universal solution for almost all sound sources. A built-in Bluetooth and integrated full-range stereo speakers can transform a turntable into the wireless speakers. Vinyl-to-MP3 recording offers conversion of the audio from vinyl records to the MP3 format. The 471NA-0002 is a turntable with a belt drive in a really low price range, which means that at some point you will need to replace the belt. The PL-990 is the lightest (5 lbs only) and the cheapest of its line. It has a traditional Pioneer design, goes in a black color, and looks appropriate in a set with any other devices. The Pioneer PL-990 is a high-tech, fully automatic device. Its direct tonearm is resistant to resonance, which partly compensates the effect of a light plastic table. You can safely play even expensive and rare records because, despite the lack of adjustments, the tonearm is already well balanced. In addition, the device has a plastic drive and built-in equalizer. The disc diameter is 295 mm, and the rotational speed varies from 33 to 40 RPM. At the same time, their switching is fully automated. The clamping force of the device ranges from 2.5 to 4.5 g. The player has a decent sound quality, and the ratio of signal and noise is 50 dB. 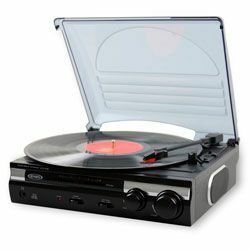 Based on its specs, I can say that the PL-990 can be potentially the best record player under 200 dollars for newcomers. Also, it has a good prospect for an upgrade, so if you slightly modify it, you can end up with a HI-FI level device. A small detonation level of 0.025% prevents sound distortion. The turntable is equipped with a precise servo motor that ensures smooth rotation of the platter and eliminates spindle oscillations. The lack of a built-in voltage regulator affects the speed of the player. There is no possibility to turn off the built-in phono pre-amplifier which makes it impossible to use an external device. The Music Hall usb-1 has a traditional design, with clear edges and glassy polished cabinet. 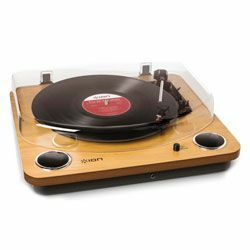 Only this model is equipped with everything for digital re-recording of music the from vinyl record, despite it is the most affordable turntable in its line. For this, there is a USB port and specialized software for installation. There are also traditional attributes such as anti-skating, strobe, and speed control. For a democratic price, you will also get a quality Japanese Audio Technica head, a phono pre-amplifier, and a USB cable. The device is equipped with a quiet belt drive and operates at two speeds, 33 1/3 and 45 RPM. S-shaped tonearm has static balancing and precise speed control. 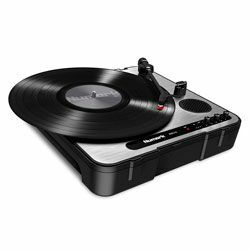 This convenient and easy-to-use device is among these turntables under 200 dollars that were made for music fans who like both analog and digital sound. With all the additional features, the Music Hall USB-1 still remains a budget device. The level of sound is quite suitable in order to just listen to vinyl records. The model is equipped with detailed instructions for the quickest assembling and tuning. The turntable kit includes the integrated preamp, cartridge, and all the cables and software, so you won’t need to buy any additional equipment to use the turntable. Despite the fact that the Music Hall usb-1 claims to be a modern device, it has full manual control. 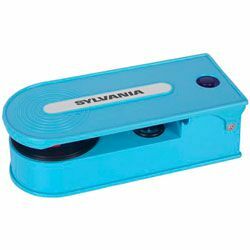 The device is equipped with an integrated RIAA phono stage, which provides the ability to connect the player to the input of an amplifier or receiver directly. Phono pre-amplifier, if necessary, can be easily turned off. The turntable is equipped with an automated playback system, which independently sets the arm to the position. It is only necessary to set the diameter of the plate and the speed of rotation of the disk with the help of a switch. The signal-to-noise ratio is 60 dB, the detonation is 0.15%, which is quite decent for the record players under 200 dollars. The construction of the turntable is very simple, which makes it more resistant to breakage. The speed switching is automatic. 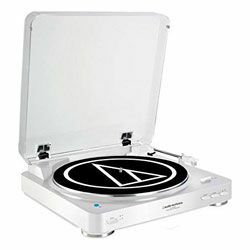 The turntable comes with a MM DSN-82 type head, which allows starting to listen to the player immediately by connecting the player directly to the speaker system. The Denon DP-29F was designed for music fans that prefer an analog sound. Its easy setup will allow even beginners to install it quickly and to use without any difficulties. The cast aluminum support disc guarantees normal geometry. The pressure of the head on the reservoir is configured to eliminate the appearance of scratches. 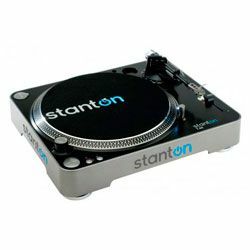 The turntable is sensitive to vibrations due to a small 6.2 lbs mass. Heavy supporting disc with relatively small engine power. The RT80 cabinet is made of a heavy wood that provides isolation from all the unnecessary vibrations. 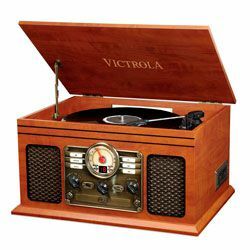 The turntable kit includes a tinted dust cap, 6-inch RCA cable, and 100-240V AC power adapter. The RT80 can be called a turntable for novice vinyl amateurs. 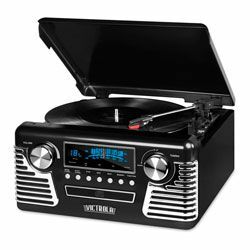 It replicates both new and old LP and EP vinyl records with decent quality. The Audio Technica AT91 cartridge is attached to an S-shaped aluminum tonearm with an advanced anti-roll system that adapts to each plate. The tonearm also provides a smooth movement of the stylus, which is especially important to prevent scratches on the vinyl records. Reverberation is solved with the soundproof stands and an aluminum disc. It also has a diamond tip for precise reproducing of the decent-quality sound and a conical stylus that provides freedom from distortion. 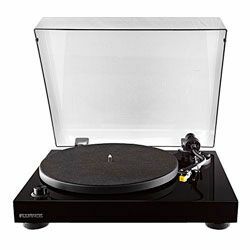 On the whole, the Fluance RT80 can possibly be the best $200 turntable for vinyl newcomers that don't want to break the bank buying their first vinyl player. 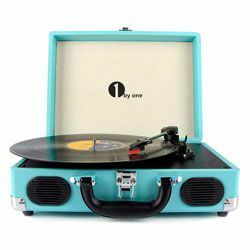 Fluance has an online tutorial that provides setting up of the turntable in a matter of minutes, even if you know nothing about vinyl players. 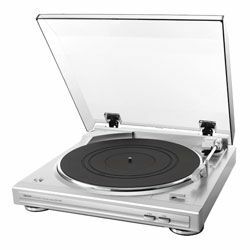 The turntable is supplied with an automatic stop at the end of the record that prevents unwanted wear of the stylus. 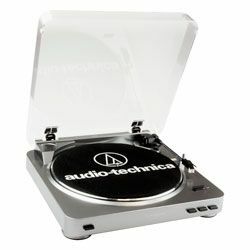 The RT80 makes loud noises if it is located next to other electronic devices, so you have to place the turntable in a special place, away from them. The AT-LP60-USB has a plastic cabinet, a primitive, clean design and looks very simple but equipped with a removable transparent dust cover. The turntable goes almost fully assembled, tuned, with a mounted pickup head on the tonearm. The turntable is able to operate at two speeds of disk rotation: 33 and 45 RPM. The player is also equipped with a vinyl record diameter switch (7 or 12 inches), which helps automatics choose the initial position of the pickup needle when starting playback. 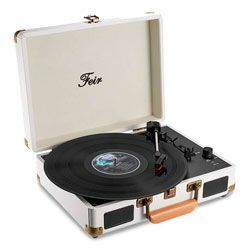 The turntable has a non-detachable RCA cable and also comes with an RCA mini-jack adapter (3.5 mm) for connecting to the appropriate devices. The Audio-Technica's built-in phono equalizer gives the possibility to connect the player directly to a Hi-Fi system or a pair of active speakers. A switch on the back panel allows using an external phono stage. For the ultra low price, you are getting quite worthy level of sound with rhythmic bass. It also had good potential for upgrade: by adding an external phono stage, the sound quality can be easily improved to a HI-FI level. The AT-LP60USB has a USB connector on the back if you would like to digitize your records. The turntable has an autoplay function so you will never scratch records or damage the needle. The turntable has very short non-detachable RCA cables.